� Connect under pressure both side-easy conn-disconn. � Quick connection and disconnection of up to four hydraulic, electrical and pneumatic lines without any risk to incorrect connection of the lines. � Flat face couplings: Easy to clean avoiding contamination of circuit. No fluid loss to the environment. � Couplings mounted on the plates with threaded sleeves or seeger/snap rings for easy installation or replacement. � Using FAP couplings with triple valve system, it is possible connect and disconnect with high residual pressure in the circuit. � Singles female couplings can be connected manually to the male couplings on the fixed half. � This can be very useful for the connection of auxiliary lines that are not fitted in the mobile half. � Possibility to fit electrical connector for electronic control system on the equipment. 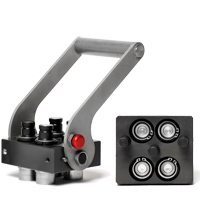 � Mechanical connection by internal cams and locking pins eliminates brinelling effect on the couplings. � Easy to install also on pre-existent system. Safe and simple to use.